There are over 6,000 Essex Regiment War Graves in France and Belgium alone that are maintained by the Commonwealth War Graves Commission (CWGC). War cemeteries are simultaneously depressing and inspiring places to visit especially if there is a personal connection to one of the soldiers who is buried or named there. They are all built on land donated by the Governments of France and Belgium and kept to an exacting standard by the CWGC and all are familiar but each was specifically designed to be suitable for the location and geography. In the aftermath of the war there were many more cemeteries that is the case now. Many were quite small, especially those near to Casualty Clearing Stations or front lines that were established and quickly moved. After the wars men were exhumed from these cemeteries and moved to a designated larger cemetery, usually in the general area so some of the men have been moved from their original resting place.. Some contain memorials to those who have been lost but whose bodies have not been identified. If you are visiting to view the headstone of a specific person then a visit to the CWGC website is required before you travel. Be careful to note down the Zone, Row and Headstone number to make it easy to find the headstone. Many people are surprised at the both number of cemeteries and the huge number of headstones that can confront them near to the sites of front line or hospital. CWGC has an app which helps locate its cemeteries. They also publish an atlas ' Cemeteries & Memorials in Belgium & Northern France' which covers the cemeteries from the Great War. Many cemeteries are in farmland on quiet back roads so care is needed in driving. They are normally well signed from the nearest villages. Most will have small parking areas outside that cater for normal usage but remembers that the land surrounding the cemetery is privately owned and often in regular farming use so do not block access ways etc. The cemeteries are places where people are buried having sacrificed their lives for a greater cause and so all visitors are expected to act with respect for those people who are buried and equally those people who are visiting, often in somber mood, to pay their respects to those buried. What facilities are at CWGC sites? There are rarely any facilities at CWGC sites although in the larger sites the access will provide an area that will provide shelter from Sun , wind or rain. There are no cafes and no toilets unless a display area such as the one at Lijssenthoek near Ypres is attached to the cemetery. How do you find a headstone? Built into the wall by the gate or in larger cemeteries under the entrance archway there is a cemetery register and visitors book. They are normally in a cupboard behind a door with a gold cross and the words Cemetery register. The register contains details of the cemetery and a list of all of the soldiers commemorated there. The details will include full name, regiment number and any details of next of kin provided by relatives. Importantly the register will also contain details of the plot, row and number of the headstone. In the front of the register there will be a plan which will indicate the plot. Hold the map and look at the cemetery to identify the plots. When you reach the plot each headstone will have the row and number in the row on the upper side of the headstone. The guide will usually provide other details of the cemetery and provide information about the likely causes of death i.e. near front line, near casualty clearing station etc. 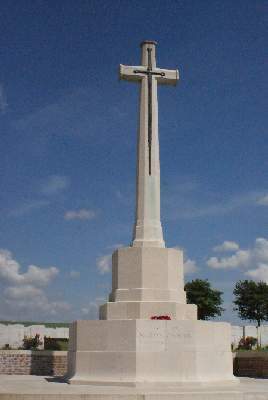 The cemeteries all feature the cross of sacrifice which is a downward sword for which the hilt forms a cross. 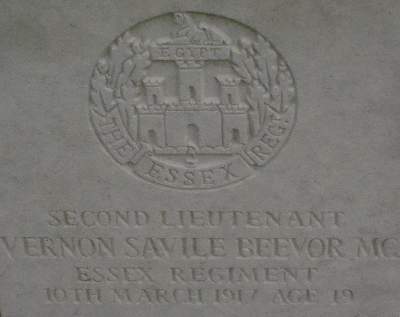 This is normally next to a stone altar called the Stone of Remembrance which is inscribed with the words which are linked with British war dead - " Their name liveth for Evermore"
What is displayed on a headstone? Each headstone is of identical size, material and positioning regardless of Rank, religion etc. The Headstone will contain the Rank, Regimental Number, name and any award for valour of the Soldier. There will be a graphic display of the Regiment and a graphic to identify their religion. At the base there sometimes is a message agreed by the next of kin. For those soldiers who have won the VC there is a graphic display of their VC. Some headstones will merely contain a cross and the words " A soldier of the Great War known unto God" These are for the remains of soldiers who could not be identified. In the case of soldiers who could not be identified but their Regiment is known the Regimental badge would also be displayed. Most war graves are accessible to disable visitors although this may mean access via the side gate. The entrance area is normally paved but the remainder of the cemeteries is normally short well maintained grass which should provide suitable for wheelchairs in dry weather but may be more difficult in wet periods. Some of the smaller cemeteries may require a walk of up to 400 yards along grass footpaths. Disable visitors are welcome to contact CWGC before their visit for full details of the facilities, current conditions and access for disable people.